I've read through some questions about financing anime and so on, but don't know how long it takes to produce a complete cour of anime. I'm talking writing about 12 to 13 episodes, of a standard-length anime (roughly 20 minutes, nothing like Aiura). Is there an average time needed to produce a series? Are we talking about months? We are definitely talking about months here, if not year(s). Lets first take a look at what has to be done to produce a anime to begin with. The image as found washibi's blog will help with that. Here we can see that there are 4 mayor factors to the production of a anime. Especially bigger studios, whom already have a basic set of people to work with, and money available it will take shorter then for say an upcoming animation studio. 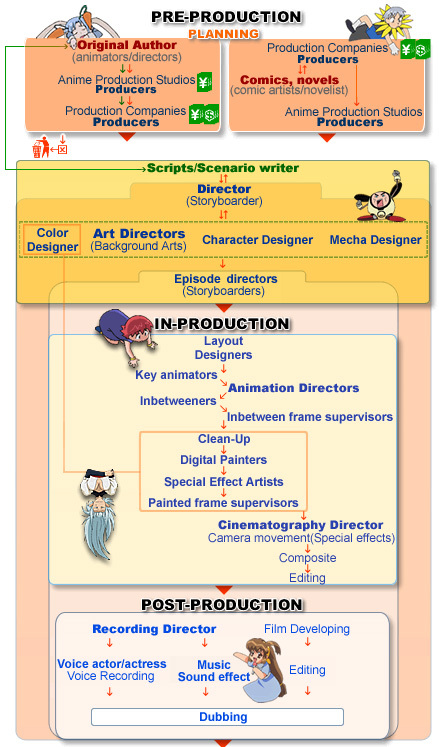 Script/scenario planning covers the planning of an episode, here they roughly produce sketches about what scenes should look and feel like, design characters, pick colors, plan dialogues etc. Often novels or manga are used as a basis for this, reducing the requirements. But for an original anime, or diverging stories the time needed might even go up as far as 1 month per episode, to plan things out in more detail. The size of the used team is also important to how long this takes in total, as bigger studios will be able to plan several episodes at the same time, as opposed to smaller studios, which will be able to plan 1 or 2 at the time. This is the part where all the fancy stuff starts. The process of animation, cleaning rendering and everything relevant to it. This is where voice actors start to come in. They will have to record the required audio, add music and sound effects to the scene, and do a final round of editing to clear out some of the left over mistakes. So a cour takes +- 6 months? Yep, in the most positive scenario it will take about 6-7 months to create a 'cour' from scratch. And with a bit of bad luck, it can run up to 1~2 years even. Which all depends on the team size, how efficiently they can work together, and how much of the production can be done side by side.